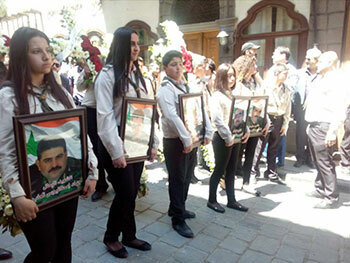 On Tuesday 25th April, in Damascus, Melkite Catholic Patriarch Gregory III Laham of Antioch finally celebrated the funeral Mass for five Syrian Christians who had been abducted in 2013 by Islamist extremist rebels in the city of Maaloula. Following the Mass, their remains were finally laid to rest in this majority Christian city from which they had originated. According to information given to the Catholic charity Aid to the Church in Need (ACN) by sources within the Melkite Catholic patriarchate, the unidentified remains of five bodies were discovered three months ago in a cave in the Lebanese region of Irsal (Aarsal), on the frontier with Syria. After the necessary investigations and tests the remains were finally identified as belonging to 5 of the 6 individuals abducted on 7th September 2013 by Jabhat al-Nusra, one of the rebel factions involved in the Syrian conflict. There is still no news concerning the sixth person, who was abducted at the same time, again according to the same sources. The Lebanese authorities formally handed over the remains to the Syrian authorities in the frontier town of Jdeidet Yabous, from where they were transferred to Bab Touma, a predominantly Christian suburb of the Syrian capital Damascus, where the funeral was held. All five individuals were Christians, four of them belonging to the Greek-Catholic Church and one to the Greek Orthodox Church. For 6 years a terrible war has been devastating Syria. 6.3 million displaced and 13.5 million people are now dependent on humanitarian aid. This is roughly two thirds of the country’s population. Besides, around 5 million people are officially registered as refugees in neighbouring countries. Many of the younger children have known nothing but war and exile from their homes. The Melkite Catholic patriarchate in Damascus has asked ACN to help in providing food for around 1,500 refugee families living in rural areas round about the capital Damascus. The idea is to provide basic necessities, such as milk for children, lentils, sugar, tea, oil canned goods and other basic necessities for the next three months. 15 volunteer helpers will distribute the food from three centres. Aid to the Church in Need is helping with $246,000 – approximately $55 per family per month.